High Heels —— From spring summer 2012 Valentino Red, we propose the most beautiful images of models of shoes designed by Italian fashion house most famous in the world. The Red Line of Valentino as always leaves ample room for reason and inserts from retro, bon ton romantic and glamorous touches that make creating a recognizable brand. During the summer, the Red Line relies on must have some of the most interesting, beginning with the rediscovery of a passion for denim is scoring several collections of high fashion, and finally reaches the floral patterns typically spring. Let's look together with the collection. As I said, the Red line like so many others, chooses to invest in denim for its most distinctive models. Specifically we talk about beautiful plain sneakers with contrasting white strings, logo on a white ribbon and a nice side. The price on the official site is 190 euros. The line also includes high-heeled sandals and pyramid, complemented by open-tip-toe denim belt with bow and side studs (190 euros), and still beautiful cork wedges and espadrilles with adjustable ankle strap, heel height 12 cm and plateau of 3 cm, and still bow at the tip (250 euros). The line includes both models of sandals with high heels to flat shapes. 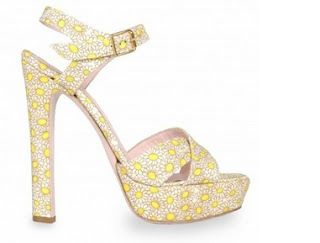 In our photogallery you can find shoes in canvas printing with lovely yellow daisies, high heel and platform of less than 14 cm to 3.5 cm (270 I), proposed with the tip lists braided open toe in yellow or pink, more romantic (290 euros ). Very beautiful models with heel and platform models cage with rope and net lists leather in colors such as classic black and beautiful baby pink (295 euros). In the line of flat sandals in calfskin models stand out with strap and bow with studs (210 euros) and of course the beach sandals in many colors (59 euros). Rounding out the line then there are the beautiful ballerinas, pumps, and mary jane, the top models of each collection Red. Among the decolletes it points out the model with patent bow and point d'esprit tulle effect (280 euros), while the mood is more distinctly retro leather mary jane with laser processing and bow side (295 euros). The premium line of dancers forms a narrow point in many pastel colors (220 euros).